How much faith should we place in what scientists tell us? Is it possible for scientific knowledge to be fully 'objective'? What, really, can be defined as science? 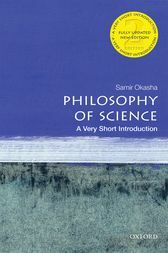 In the second edition of this Very Short Introduction, Samir Okasha explores the main themes and theories of contemporary philosophy of science, and investigates fascinating, challenging questions such as these.Starting at the very beginning, with a concise overview of the history of science, Okasha examines the nature of fundamental practices such as reasoning, causation, and explanation. Looking at scientific revolutions and the issue of scientific change, he asks whether there is a discernible pattern to the way scientific ideas change over time, and discusses realist versus anti-realist attitudes towards science. He finishes by considering science today, and the social and ethical philosophicalquestions surrounding modern science.ABOUT THE SERIES: The Very Short Introductions series from Oxford University Press contains hundreds of titles in almost every subject area. These pocket-sized books are the perfect way to get ahead in a new subject quickly. Our expert authors combine facts, analysis, perspective, new ideas, and enthusiasm to make interesting and challenging topics highly readable. Samir Okasha is Professor of Philosophy of Science at the University of Bristol, where he has taught since 2003. He currently serves as Associate Editor of Philosophy of Science, and has previously served as Associate Editor for the European Journal for the Philosophy of Science. He is currently the holder of a European Research Council Advanced Investigator Award, for a research project entitled 'Darwinism and the Theory of Rational Choice'. His articles haveappeared in multiple leading philosophy and science journal, and he has authored several books, including Evolution and the Levels of Selection (OUP, 2006) and Evolution and Rationality (CUP, 2014).